JUnit is a unit testing framework developed for Java programming language. JUnit plays key role in the development of test-driven development. It is considered as one of a family of unit testing frameworks collectively known as xUnit, that originated with JUnit. 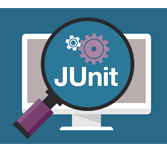 JUnit tutorial discusses about the use of JUnit in your project unit testing, while working with Java. Once you complete this tutorial you will get relevant knowledge in using JUnit testing framework. JUnit tutorial has been prepared for beginners to help them understand the basic functionality of JUnit tool. To lean this tutorial you need to have the knowledge of software development using any programming language, especially Java programming and software testing process.